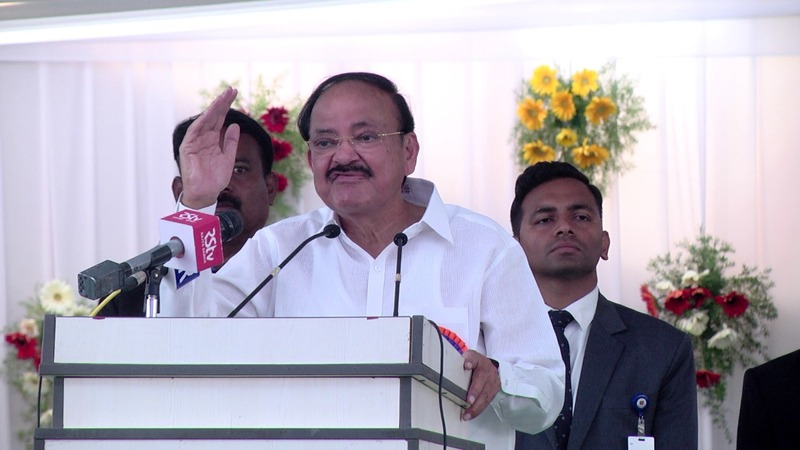 The Vice-President of the India , Mr. M Venkaiah Naidu, visited IIIT Nuzvid on March 14, 2019. Prof. V Rama Chandra Raju, Vice Chancellor of this university and Director Prof D Surya Cahndra Rao, Smt K Damayanti, Principal Secretary for Higher Education, along with their colleagues, welcomed Mr. M Venkaiah Naidu to the campus. Honourable Vice President Shri M Venkaiah Naidu was impressed by the academic and extracurricular activities on the campus during his interaction with the IIIT Nuzvid students in Nellore and decided to address them. Immediately the programme was scheduled on March 14, 2019. Rajiv Gandhi University of Knowledge Technologies (IIIT-Nuzvid) took it as prestigious moment that the Honourable Vice President of India is interacting with the students and took it as a challenge to make the programme successful. Under the able guidance of the campus Director Prof D. Suryachandra Rao, and consistent help and support by the Sub-Collector Swapnil Dinakar and police officials, the administration could coup up all the necessary arrangements on the campus on war foot. Finally, the day has arrived. The Chancellor(FAC) and Vice Chancellor Prof.V Ramachandra Raju, Registrar Prof C Gangaiah, Director CETLS, Prof SSSV Gopala Raju, Public Realtions Officer (Head Office) Prof Narasimha Raju have arrived so early to look after the proceedings. Principal Secretary for Higher Education Smt K Damayanti was also one among the Guests. Post-Lunch Academic activities are suspended. Students were instructed strictly to be discipline and adhere to code of conduct. Of course, as always, RGUKTians are disciplined. They turned up to the meeting so huge in number that it became hard to accommodate them all. Some Cultural activities and Yoga performances were performed before the arrival of the Honourable Chief Guest. The audience including the officials from VPI Office and other dignitaries and students and staff has enjoyed themselves so much with the scintillating performances of the student-artists. The Honourable Chief Guest has arrived to campus on schedule sharply at 3.45 PM. After having an interaction with the administration at Q-1 Guest House, He started to venue without any delay and hesitation. He blessed the students of Yoga at Q-1 who have come for the same. He reached the venue on foot in a quick pace. As immediately as he reached the venue, Guest of Honour was offered by the NCC Cadets in a grand manner. He moved into the students mob to meet and greet them. In no time, the venue was resounded with their claps and cheering. Their excitement could find no limit. Honourable Chancellor(FAC) and Vice Chancellor have started the proceedings for the day. He invited all the dignitaries on to the dais respectfully. The Principal Secretary for Higher Education, Andhra Pradesh Smt K Damayanti, the Registrar of RGUKT Prof C Gangaiah, Director of IIIT Nuzvid Prof D. Suryachandra Rao were the other guests on the stage. The Honourable Vice President was accompanied by his Staff Officer and PSO on the stage. Smt Damayanti explained the educational system of RGUKT to the Guest of Honour. And then the Special Guest of the evening, honorable Vice President of India, Shri M Venkaiah Naidu’s oratory skills spell bound the young audience. His rhythmic speech tied the students speechless. Every word of his speech is welcome with a great applaud. The detailed speech is kept under for your reference. The progrmme met its end with Director of IIIT Nuzvid offering vote of Thanks to who arrive and participated made the progrmme successful completion of the meeting, all the participants have left the menu with beautiful reminiscences and inspired with sincere commitment to promise become a strong stakeholder to achieve brighter rural India. Finally, it was the greatness of the Honourable Vice President that he called the student-artists to take a photo with them.